Ever have one of those weeks?? I'm just SO tired right now! I feel like I could fall asleep on the spot, and if I'm sitting down, sometimes I doooooooooooooooooooooo....Huh?! Oy vey! Late night blogging doesn't help, and neither do early mornings. And I'm reading again at night - "Divergent" this time. I've got to get a handle on this! 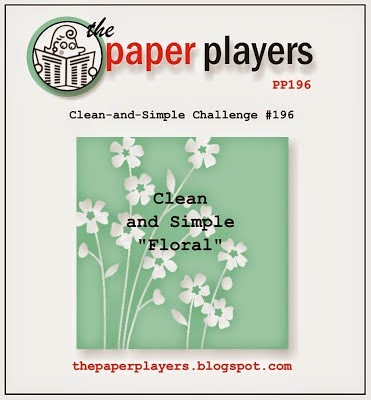 Another Clean and Simple challenge with a floral theme. I looked around for a stamp set that would let me feature the Stampin' Blendabilities alcohol markers again with a floral design and I came up with the Hostess Set, Simply Sketched, which is retiring in a week! So I got out my Gorgeous Grunge stamp set for a little blotch and splatter in Crisp Cantaloupe and Daffodil Delight. 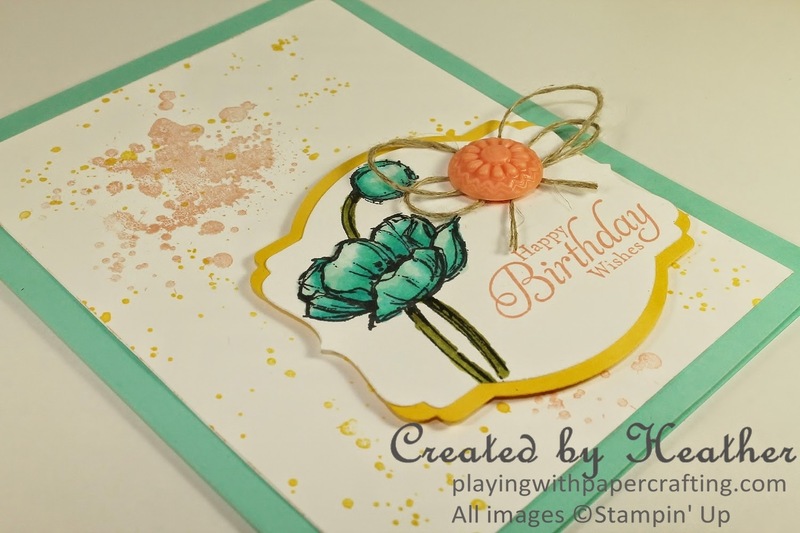 The main image from Simply Sketched is stamped in Tuxedo Black Memento Ink and coloured in with the Stampin' Blendabilities markers. 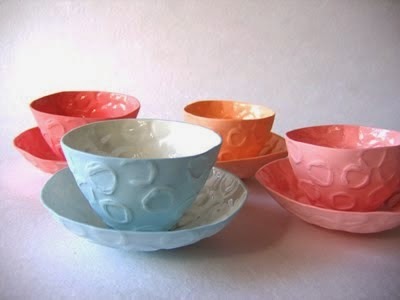 I will have a video for you on how to use them in a few days. After stamping and colouring it in the main image and sentiment are diecut using the Deco Labels Collection Framelits. I also diecut the same shape and size from Daffodil Delight cardstock and then cut in in half and removed the little points from the sides before adhering them to the back of the main image panel, each half a little offset in order to show a narrow margin above and below. With the addition of the In Colour Boutique detail, (also retiring soon) and some Linen Thread loops the card is completed. Clean and Simple enough? I think so! 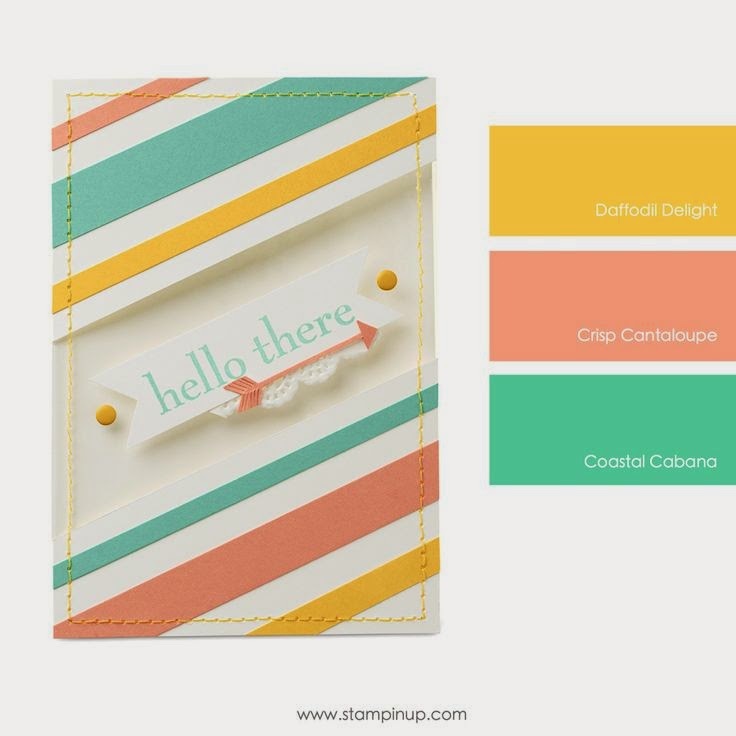 I still have a few spots left in my Stamp of the Month Club, which will be starting in June! Contact me by phone, 250-768-7379 or fill in the on-line registration sheet on the link and you will be ready to go for the new stamp set in June! I will post photos soon! *New Product in the 2014/15 Annual Catalogue, available June 2. ***Retiring product. Order before the end of May before it's gone for good!